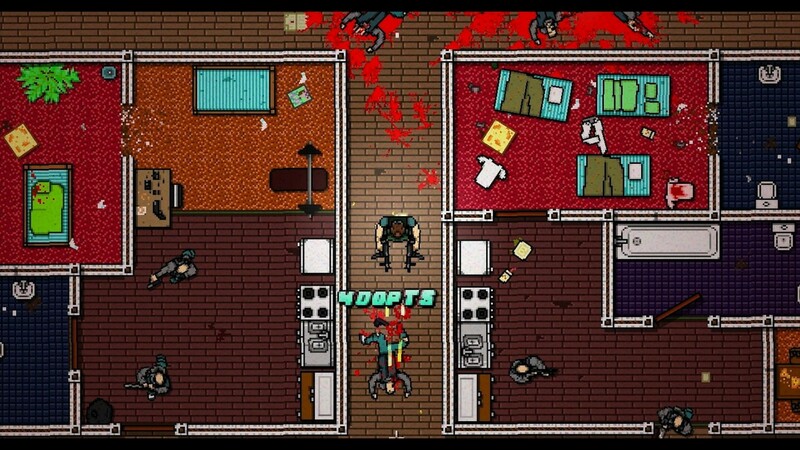 Hotline Miami was a violent, gory game with a thumping soundtrack orchestrating the ultra-violence throughout, while poking fun at the state of current games and asking you as a player, “Do you enjoy all the killing?”. It was praised universally, and was bloody good fun. Now we got a second one; is it more of what we loved, or is it not enough of a difference to make it worth playing? For those who are unaware, or didn’t play the original, here’s a quick rundown. It’s a top down shooter, with a focus on quick deaths, and a lot of restarting. It becomes more of a puzzle, with you figuring out guard routes and trying your best to execute your plan as possible, which will rarely happen. The controls are tight and work with whatever method you choose. Mouse and keyboard work just fine for aiming and locking onto targets, whereas I went with an Xbox controller for a more twin stick approach to the combat. 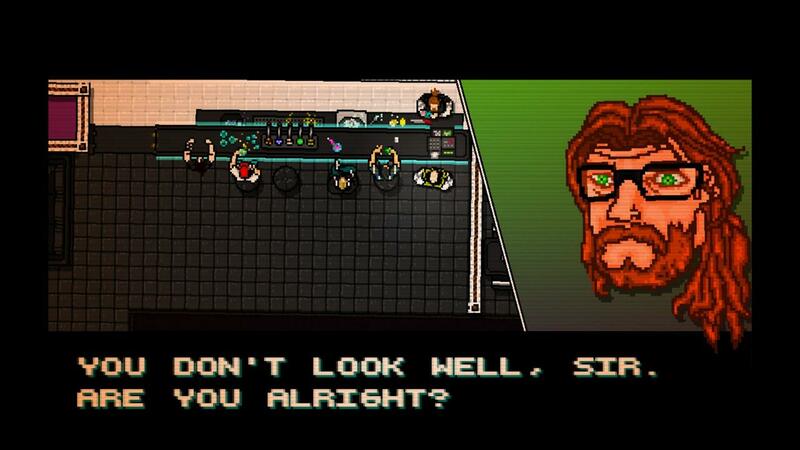 So what’s new or different in Hotline Miami 2? Right from playing, you’ll notice that the game is a little more restrictive on a level to level basis, and not as free form as the first, due to for the most part, a lack of character selection. You’re forced into a character’s perspective, along with whatever gameplay elements they have. Leading on from this, the story is way more disjointed this time around, due to the jumping between characters, as well as going backwards and forwards in time as a result. Granted, the original games story isn’t exactly straightforward, but it’s way more convoluted this time around. This second outing does give you more backstory to the characters and their motives, or lack thereof, for their actions. The levels are a lot larger this time around, both in actual size and the amount of sections to some of the levels, the boat level being a good example. The enemies are also more varied, some run quickly at you in a craze, and some can only be taken down via gunfire or sometimes only melee. All of these changes overall make for a harder game, which will challenge and fire up some, but could potentially frustrate others. Going back to the potentially restrictive nature of the game, let’s talk about the characters. There are nine to play as this time, and sometimes you get a choice, sometimes you’re forced to play a role. 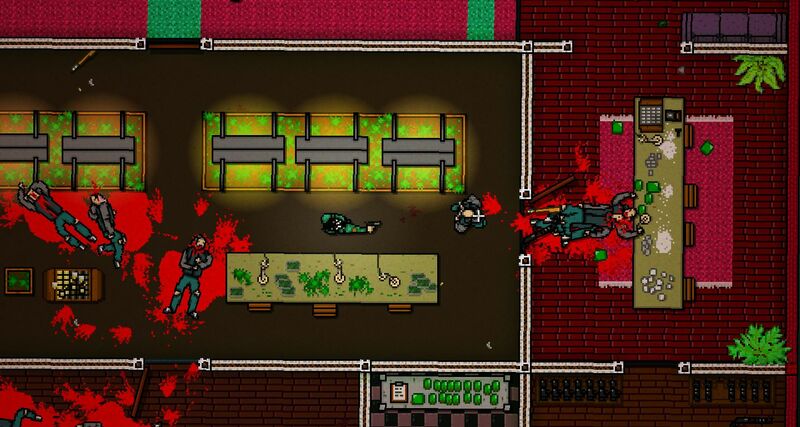 One of the roles you can play is as the Fans, who are a bunch of people who were in awe and inspired by the original Hotline Miami protagonist’s murder spree, and want to emulate it. As such, it plays similar to the original, giving you a choice of masks, each giving a different edge to your play. One character cannot pick up any weaponry, and as such can only kill by punches and executions. The second character starts with two sub machine guns, and can fan them out to shoot in a very John Woo style. Of the last two, one has the ability to perform an invincible dodge roll and the other is actually a set of twins who work in unison, one wielding a chainsaw and the other using all of the guns. Another role is the Soldier. Set in what looks like a Vietnam flashback to begin, looking very much like the original Metal Gear with all the forested areas. You get a choice of weapon instead of mask here, and you stick with that weapon for the entire level. This changes the formula, as you’re not allowed to pick up any enemy weaponry upon emptying your gun, and instead must rely on ammo crates for more gun play. This is helped by your ability to alternate your fire mode, which brings out a knife for some CQC combat. The whole idea of being conservative with your ammo, and making sure you’re not out of bullets for when you need them, is a nice little twist to the regular gameplay we’re used to. So my favourite bit about this whole game isn’t the addictive, fast paced gameplay and the various characters you can play as, it’s the music. 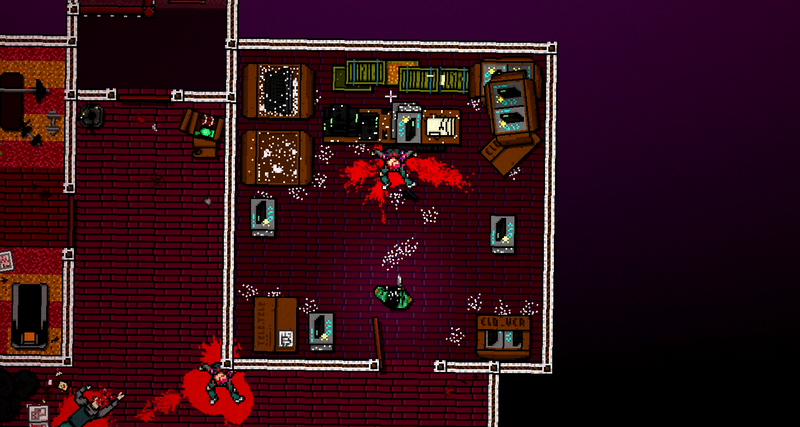 The original Hotline Miami’s soundtrack was loved by many people. The second game takes it further and makes it quite possibly one of my favourite video game soundtracks ever. Much like the era the game is set in, the music is a kind of 80’s throwback, with electronic vibes of today thrown in for a thumping soundtrack to all of your calculated killing. More levels in the game gives us more of a soundtrack to listen to, and it really doesn’t disappoint at all. The stealthy vibes of M.O.O.N’s Delay in the Jungles, to the fast paced loudness of Roller Mobster by Carpenter Brut. This game got me into a whole genre of music I’d never even heard of before, and I love it. As I said before, the story in this game is completely jumbled up. Seems as though they just threw sections in wherever they pretty much wanted, almost randomly. Sometimes you will be playing the same character for an act or two, to them be thrown backwards in time 15 years to play as a completely different character, for no real discernable reason. It does differ from the original, as you get much more of a backstory to each of the characters you play, which is a bit easier to follow in those sections. The over arcing story is still a bit hard to follow though. I do recommend sticking with it though, as the final sequence in the game is mind-blowing and definitely worth playing. The game didn’t come without its controversy though. It’s pretty messed up in some sections and it doesn’t hide it, with some questionable sequences shown. At the very start of the game, there’s a scene which implies sexual violence, for it only to be cut and shown as a film scene. The game does warn you of this before you begin playing, allowing you to skip this sequence in its entirety. Another section shows you slowly and brutally beating to death one of the characters you’ve previously been playing as, while they slowly beg for their life, completely unaware of what’s going on. One of the bonuses to this version of the game on PC, is a level editor for everybody to use. It’s incredibly easy and simple to understand, letting anyone with a vague idea of what they want to do create a level with ease. I don’t have much of an interest with it, but I hope that the community will come up with the amazing levels to try my hand out at, and maybe some homages to other game franchises while we’re at it. So overall, it looks very similar to its predecessor, but the framework that fits around the core ultraviolent gameplay has been changed significantly. Some people will not like the restrictions placed upon them for scenes. Personally I loved being forced to play in different ways, as the original gave me too many options, leaving me to pick pretty much one mask for the entire game. It’s more of the same run and gun violence from the original, puzzling and tricky, but feels fantastic to pull it all off successfully. If you didn’t like the first you won’t like this. If you wanted a more fulfilling experience form the first game, this is definitely what you want. This entry was posted in Uncategorized and tagged Dennaton Games, Devolver, Hotline Miami 2. Bookmark the permalink.